The Aryan Brotherhood is the most ruthless, vicious and unrelenting gang ever founded. They live by a code of violence and make merchandise of death, drugs, prostitution, and firearms. The Brotherhood is a white racist prison gang called the Aryan Brotherhood or AB Brand. They have been a scourge to the American prison and society at large, for decades, and there seems to be no end to their nefarious activities. Though they are about 1% of the total prison population yet about 20% of crimes committed in the prisons are perpetrated by them. The AB dates back to the mid-1960s. They are said to have evolved from an Irish biker gang the ‘The Blue Bird gang’ which was an all-white prison gang formed to strike back at racial prison gangs formed due to desegregation of the US prisons. Their initial aim was to rally and protect inmates of the Caucasian (white) race against notable black prison gangs like the ‘Black Guerilla Family’. This ideology has however shifted to mere profiteering as the AB is known to partner with gangs of other races for the purpose of financial benefits in drug trafficking, murder-for-hire, inmate prostitution etc. Some notable allies of the Aryan Brotherhood include The Mexican Mafia and The American Mafia (through John Gotti). The origins of the AB Brand can be traced back to San Quentin Prison in the early days but rose to prominence under Barry Mills and Tyler Bingham who were serving multiple life sentences. These two were instrumental in creating and developing the gang’s power structure in 1980. Under them, the gang’s influence spread from federal to state prisons all over America and beyond prison walls. In 1980, the AB Brand came up with a military-style hierarchical leadership structure such as presidents, vice-presidents, majors, captains, and lieutenants. They have a twelve man council elected by majority vote answering to a three-man commission. This tight and efficient power structure is what has made the gang more powerful, dangerous and deadly. Some of its past leaders who were at some point referred to as Generals are; Barry Byron Mills, Larry Bryan, John Greschner, Steven Stainless Cooke etc. Moreso, the gang members adopt a nickname like Dirty, Tuff, Slick, Magic or Rock Star among others. Some of their key leaders are currently still serving either multiple life sentences, on death row, or already dead in the prison. This gang’s mode of operation is different from the rest. The major crimes and atrocities they are mostly known for, are prison prostitution, drugs trafficking (mostly methamphetamines), armed robbery, Kidnapping, Arson, Murder for Hire etc. 3. Barry Mills: Nicknamed “Baron”, he is notably the number one man in the AB hierarchy. He was serving 4 life sentences before he was found dead in his cell on the 8th of July 2018, a day after his 70th birthday. 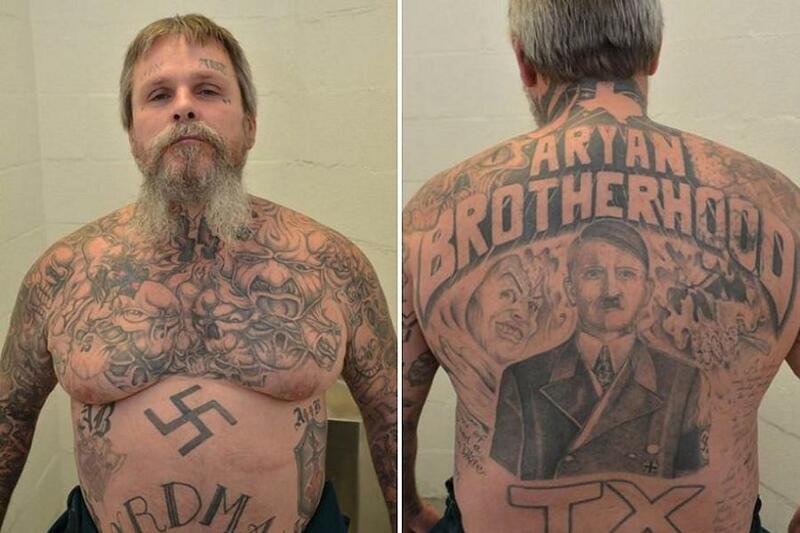 Aryan Brotherhood members are identified with various kinds of symbols and tattoos. The major entry-level tattoo for a new member (called a probate) is the Brand Patch consisting of a shamrock, the letters “AB”, lightning bolts and the number “666”. However, defaulting members are ordered to ink out their tattoos or have it burned off them by force. The Brotherhood lives by a very strict code of ‘Blood in Blood out’. Meaning that membership in the gang is a life-long commitment and the only way out is in a coffin. On initiation, every probate signs a form with sponsors and guarantors attesting to them and are made to swear an oath. They communicate with the 400 years old binary system and they have strict and different sets of rules and constitutions. Members are expected to uphold, abide by and adapt to it as they are reviewed. Betrayal by any member gets the death penalty straight. Most of them are kept in solitary confinement away from other inmates because of their brutal personalities. Women are not allowed to be members but some have been found to be supportive of the ideologies of the gang. All members are expected to remit a part of their criminal proceeds to a common purse of the gang during their meetings.